College tuition has increased faster than the rate of inflation for some time now. But the issue is more complicated than this simple observation suggests. 1. The increase in tuition cost at public institutions is mainly due to cuts in state support (see figure below), as opposed to enlargement of the overall budget. 2. The average amount paid per student is typically less than full tuition, due to financial aid. Redistribution is taking place, from families that can afford the full rate, to those that need assistance. The year to year rate of increase in the average tuition paid has typically been less than the increase in full tuition per student ("sticker price"). 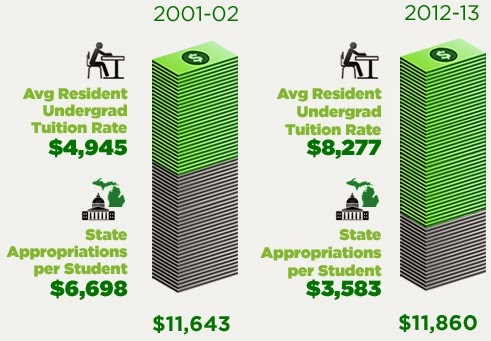 Below are the specific numbers for Michigan State University -- full tuition in 2012 for Michigan residents was ~ $12k. Here's more data (thanks to Dave Bacon) supporting my claim for public institutions of higher learning: total expenditures roughly constant, tuition changes related to internal cost shifting. Note, though, that private research universities are an exception: they've been raising both tuition and expenditures in recent decades. I wonder if state support going down and tuition fees going up may both be linked to increased availability of Federal loans? I believe the decline in state support for higher education in the US is mainly driven by budget pressures -- specifically, health care and other costs. The availability of student loans has cushioned the problem (from the perspective of universities), but is not the cause. "Education used to make up a bigger share of state spending. When the association first began compiling the report in 1987, elementary and secondary education made up the biggest share of state spending, and higher education the second-biggest share. Medicaid surpassed higher education as the second-biggest state program in 1990, and in 2003 it became largest state program for the first time." All of this is interesting, but the stories I hear from prior generations at MSU tell me that a student in 1965 could work in the summer and pay for tuition at Michigan State for the entire year. To me that is the important difference. What combination of changes have made a college education less affordable in inflation adjusted dollars: falling wages for unskilled student labor during the summer, higher relative spending by the university or lower support from the state? Additionally there needs to be an evaluation of historic changes in spending on undergraduate instruction versus other expenses. I believe this type of analysis will show that by 1995, the real adjusted cost of providing, and the price of purchasing an undergraduate degree at MSU will have increased significantly from 1965. You need to understand these structural changes between 1965 and 1995 if you hope to understand what has happened. Sometimes, public college schools were the most typical school that many students would prefer especially that they can still be able to get the learning that they need and also they can be able to have many opportunities in terms of scholarships and some assistance financially. I think Tim called it right a shift from State money to easy money Federal student loan dollars? 10% repayment cap after living expenses with forgiveness at 10 years for public service jobs. I am rethinking the plan to get the girls through school with no debt. We max out the student loan debt and get them through masters degrees and into government jobs and stick the feds with the tab.